On Monday, President Trump expanded the “global gag rule” to mean no funding can go to any NGO that also discusses abortion with beneficiaries anywhere in their operations. This expansion grows its impact from about $600 million to $8.8 billion in funding. 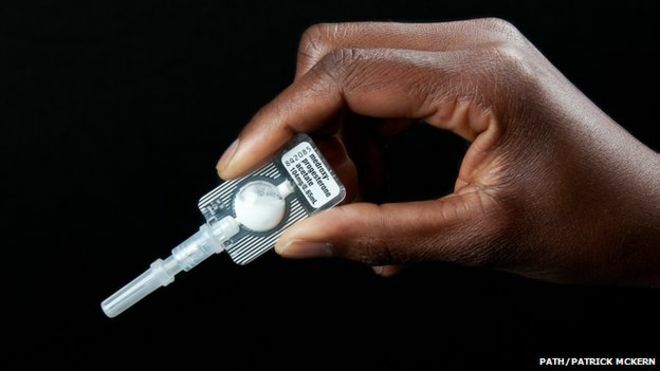 There’s a birth control that women can inject themselves (photo above) with minimal training. Each one lasts 3 months, and the price has just come down from $1 to 85 cents a dose. Does foreign aid work? Featuring Charles Kenny, Rachel Glennerster, and Amanda Glassman. A profile of the federal judge leading Brazil’s anti-corruption campaign, “Operation Car Wash,” which is modeled after Italy’s fairly successful anti-corruption campaign in the 1990s. One fear of UBIs is that they’ll reduce motivation for work. A review of previous UBI programs in the U.S. and Canada finds no evidence for that, but evidence of positive effects in consumption, education, and health. Melissa Dell & Ben Olken find lasting positive effects of Dutch colonialism in Java. Areas close to where colonial sugar was grown in the 19th Century have better infrastructure, more schools, and higher education levels today. And if you thought it was hard to make sure your survey questions preserve their meaning when translated into multiple languages, be thankful you’re not the sign language interpreter for Snoop Dogg and the Wu-Tang Clan. Her prep work also includes researching dialectal signs to ensure accuracy and authenticity. An Atlanta rapper will use different slang than a Queens one, and ASL speakers from different regions also use different signs, so knowing how a word like guns and brother are signed in a given region is crucial for authenticity. Sorry, there’s pretty much no video with Snoop Dogg or Wu-Tang lyrics I can post (but you can find an extended interview with interpreter and taekwondo black belt Holly Maniatty here). Nice short refreshing article! But in a way the author is not wrong.Here the author is trying to say something in disguise of some thing else.